AppleCare+ for Apple Watch Pricing: $59 for Sport, $79 for Steel, $999 for Gold. We’ve known that AppleCare+ will be available for the Apple Watch since Apple’s March 9 media event, but pricing for the extended support has thus far remained a mystery. A source has now shared some purported pricing information that may shed some light on the cost, suggesting AppleCare+ for each version of the watch will be priced differently. According to the claimed internal Apple screenshots, AppleCare+ for the entry-level aluminum Apple Watch Sport will be priced at $59, while AppleCare+ for the middle-tier stainless steel Apple Watch with Sport Band will be priced at $79. 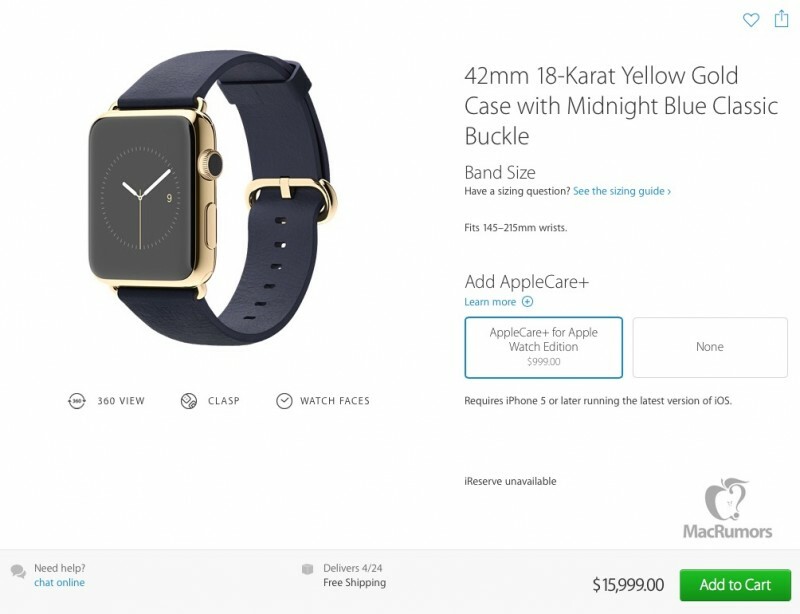 AppleCare+ for a $15,000 gold Apple Watch Edition will be significantly more expensive at $999. It is unclear from the information we have received whether band choice will affect AppleCare+ pricing, as band prices vary significantly. While we can’t verify the legitimacy of these claimed screenshots, other sources at Apple have indicated they are hearing unconfirmed word of similar pricing. Without AppleCare+, purchases of the Apple Watch Sport and the stainless steel Apple Watch will be covered by a limited one-year warranty for hardware repairs and 90 days of complimentary support. Edition Watch purchases will include a two-year warranty and complimentary support. With the purchase of AppleCare+, the warranty for aluminum Apple Watch Sport and stainless steel Apple Watch models will be extended to two years from the date of purchase, plus accidental damage will be covered. Apple Watch Edition coverage will be extended to three years with AppleCare+. Employees have not received word on how much accidental damage repairs will cost, but for the iPhone, AppleCare+ is priced at $99 and accidental damage carries a $79 service fee for each incident, with a maximum of two covered incidents. 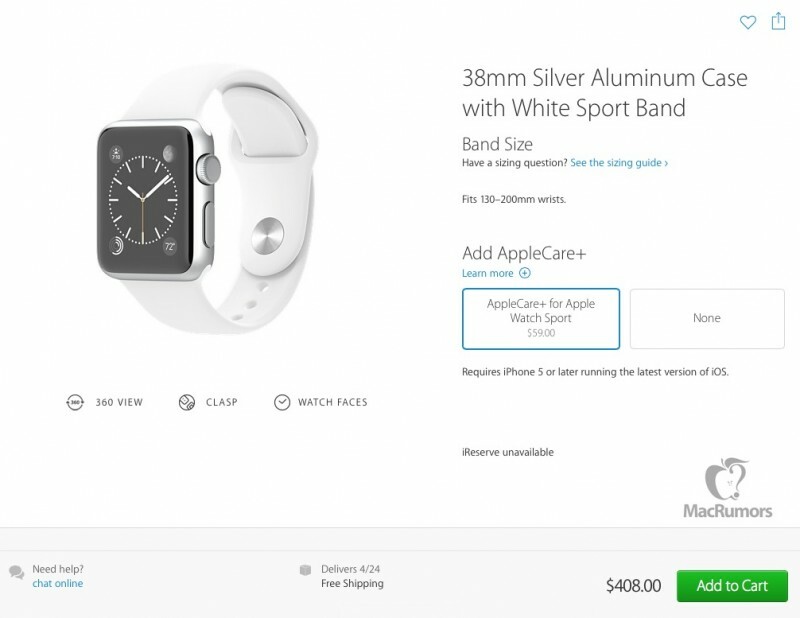 Apple Watch buyers will be able to purchase AppleCare+ as an add-on both online and in-store. With the iPhone, AppleCare+ can be purchased up to 60 days after an initial iPhone purchase, and it’s likely Apple will adopt a similar policy with the Apple Watch. The Apple Watch will be available for pre-order beginning on April 10, which is the same day that in-store try-on appointments will begin. The device will officially launch in the first wave of nine markets on April 24. This entry was posted in Apple news and tagged Apple Watch, AppleCare. Bookmark the permalink. Drexel University installs iPad vending machine to rent out tablets using library cards. 800 million Apple devices threatened by ‘WireLurker’ malware.